Your office equipment can provide several wonderful years of service, particularly when you purchase it from Xerox South Africa partners and distributors, such as DocX. However, everything has a shelf-life and eventually stops working, even a reliable Xerox copier or printer. We have all heard about how to recycle old ink cartridges, but how do we recycle our old office equipment when the time comes to replace it? First off, they’re not the kind of items that one can simply throw in the dustbin and forget about. They’re also made of materials that can be recycled, so they shouldn’t simply be thrown away in any case. But these recyclable and reusable materials need to be sorted first, so your municipality is not likely to accept a printer or copier for recycling. 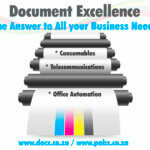 However, since 2008, for Xerox South Africa clients, there has been a solution. The e-Waste Association of South Africa (eWasa) is a non-profit organisation that was established to help businesses around South Africa safely and responsibly dispose of their electronic devices. The company, or one of their accredited companies, will pick up your office equipment from anywhere in the country and will sort all materials. Once these materials have been sorted, much of them will be sold back to manufacturers for reuse in the production of new equipment. Indeed, recycling office equipment is no longer an optional method of disposal, but is rather the duty and responsibility of all businesses. According to the Waste Electrical and Electronic Equipment (WEEE) Directive, a 2006 study conducted by the United Nations University revealed that, depending on the mixture of the e-waste, for every ton of e-waste recycled, 1.2 tons – 57 tons of eCO2 is prevented from being released into the atmosphere. This proves that businesses are now obligated to do their part for the environment and recycle materials where they can. If you are looking for new quality Xerox South Africa office equipment, then pay a visit to our friendly Document Excellence offices. We are located in Rivonia, Sandton, conveniently situated to help clients in and around Johannesburg. We have been supplying reliable Xerox office equipment and services for 12 years, and our experience grows each day. We are proud to call ourselves a Xerox partner as we deal only the best office equipment.